The intention of this article is to explore science fiction technology, championed by particular authors, from a functional perspective. To put this another way it is my intent is to explore the possible viability of these technologies as real-world goals. Over the years particular science fiction writers single out a specific technological advance and expand upon it. This article will cover those signature ideas and the authors that promote them. The difference between science fiction and fantasy, most of the time anyway, is that science fiction could become reality in the future. Speculative Fiction (another name for sci-fi) authors used to cast a wide net in their use of technology to put protagonists in interesting situations, but Isaac Asimov set a standard when he wrote so many stories about robot human interaction and a set of rules to make that interaction workable. To cover this topic in some logical order I’ll introduce an author, their “signature” technology and encourage the reader to project how that technology might be utilized if it ever became a reality. For example an author by the name of Larry Niven revisited the idea of teleportation, but in his universe he explored a wide variety of ways, including as a means of extending lifespan, that the technology could be used. Asimov is an interesting example. 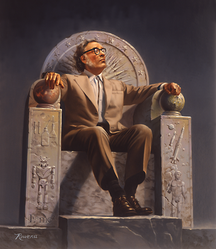 Many readers do not know this, but Asimov actually wrote more real science articles than science fiction. His signature technology is the robot. Though Asimov did not invent the idea of a mechanical slave, he certainly explored how these creations might have progressively improved over time. He is also widely known for his three laws of robotics. Runaround: In his second robot story there are problems with the devices. They are being used, off planet, to help restart a mining operation on Mercury. Powell and Donovan, two engineering specialists, send Speedy (an SPD-13 model) to a selenium pool so the two humans can repair their solar array. Speedy does not return in the appropriate amount of time and by sending a more primitive robot they find him circling the selenium pool. They determine that Speedy is caught up trying to obey human orders (law 2) while avoiding harm to itself (law 3) and has gotten itself in a feedback loop. Something in the pool could destroy Speedy, but it still attempts to follow its orders. The humans are unable to recall the robot due to its single-minded attempt to resolve conflicting orders. The problem is eventually resolved by forcing the robot to obey the first law when Powell goes to the pool, putting himself in danger, and forcing Speedy to rescue him. Reason: In this, the third robot short story, Powell and Donovan visit a space station designed to convert solar energy to microwaves and beam that energy to the earth. The station is run by QT1 (Cutie) that has somehow decided humans aren’t important, but is a believer in a religion of its own creation. Because the robot has determined that “I myself exist, because I think,” it has decided to work to become the prophet of its imagined god. With a solar storm approaching Powell and Donovan are convinced the robot will allow huge amounts of energy to destroy population centers on Earth. When all efforts to disable the robot fail they are surprised to find that Cutie performs its duties flawlessly and the reason shocks them, Cutie is doing its job properly in order to appease its god and reach heaven. Evidence: As robots advance a new character is introduced, Dr. Susan Calvin. In this story a man named Beyrley is running for office. His opposition begin making claims that he is a robot and not human at all. Byerley resists all efforts by the opposition to prove or disprove his humanity claiming that his privacy is the ultimate right and that is the core of his political platform. When a heckler challenges Byerley to hit him, Byerley does and handily wins the election. Dr. Calvin, on meeting Byerley, states that she wishes he were a robot because only a robot would be completely incapable of cruelty or injustice. She then teases Byerley by suggesting that if he were a robot he would not have violated any of the three laws if the heckler were also a robot. Compared to Asimov’s vision robots are still nowhere near as sophisticated as those in the series. It may never be possible to teach a robot what “human” is much less teach it what “harm to human” actually means. It is true that robot research and artificial intelligence are closely linked and robots become more sophisticated and useful with each passing version. As stated above, Mr. Niven did a fantastic job of exploring all of the possible uses of teleportation, but this is not what he is most famous for. His signature technology was a “ring world,” a mega structure that was so large it occupied the typical orbital area that might be occupied by a planet. Niven’s inspiration was the Dyson Sphere suggested by Freeman Dyson. Niven felt there could be an intermediate structure and came up with the ring world. Niven decided that a structure like this would be beyond even future human ability and made his central character, Louis Wu, an unintentional discoverer of this world. Wu, at two hundred years of age, is bored with life and decides to leave known space looking for adventure. Wu encounters another lifeform that humans have been dealing with called the Pierson’s puppeteer. Since puppeteers are secretive Wu has no idea why they want to explore this artifact, but he goes anyway. The story is primarily about the explorers and their adventures on the ring world. Niven did a fair amount of research to make the ringworld scientifically likely if not possible. There were some errors though and MIT students pointed them out. The most glaring that without some constant force keeping the ring in place it would “crash” into its sun. Niven wrote a sequel called “The Ringworld Engineers” in part to correct this problem in prose. This may never be likely. The amount of material required alone would be about the mass and volume of a Jupiter or Saturn. Further any material strong enough to make up such a ring, since it must spin to supply artificial gravity, is unknown to science. Still, if this were possible, the ring would easily support terrestrial life with a living area 1.5 million times that of earth. Though Clarke is known for many far-sighted technology ideas it is the story called “Fountains of Paradise” that Clarke is best known for. In the story Clarke suggests the use of space elevators. Clarke’s story is about one lone engineer who, throughout his life, proposes the creation of a space elevator. One end of the elevator is on earth and the other is in geosynchronous orbit around earth. Such a structure could get people and material into and out of orbit far cheaper than a rocket and this is discussed in the work. Clarke has also written stories about human evolution, unfathomable alien craft using the solar system as a way point, and how human civilization may be affected by extra solar influences. As unlikely as this sounds materials scientists believe that a fiber made entirely of carbon nanotubes could make this a real possibility. At least one part of Clarke’s vision is a reality, the geosynchronous satellite. These are currently used for observation and communication. Ms. Bujold is best known for her oddly dashing feudalistic prince Miles Vorkosigan. Though Bujold has written many stories about this fiefdom planet and it’s oddly egalitarian prince, perhaps her best known signature technology is the uterine replicator. The replicator is mentioned as a plot device from the very beginning and its use and development follow a logical path. Its first use is to prevent the death of a fetus in distress. As with actual technology the replicator eventually becomes the preferred method of “bearing children” as they are better cared for, have more complete health monitoring, and gender and traits can be more easily controlled. Though the technology itself is not often mentioned its impact on her human universe is huge with some planets using it for specific purposes. Ethan of Athos: is the story of a planet founded on religious principals. The premise is that monks adhering to an unnamed religious order found the planet with the intention of excluding all women due to the temptation that gender poses. The uterine replicator is used to maintain planetary population. Ceteganda: is the story of a planet populated by both genders, but reproduction is strictly controlled by the ruling council (called the Star Crèche) which is conducting a clandestine genetic experiment extending to its entire population. This program is widely known to the population, but unknown to other human worlds. Prior Art: though the artificial womb has been suggested as far back as “Brave New World,” Bujold actually gave its development a logical progression and made it a vital device for some plot points in selected stories. She also provided a far more detailed description of the device, even suggesting how blood, amniotic fluid, and other vital components would function. Ectogenesis (outer growth) is not yet possible, but as an idea has its devoted followers. The problems are reproducing the function of the placenta, passing the proper nutrients to the fetus, creating viable amniotic fluid, and ridding the device of waste. Because this device would represent experimentation on humans, an ethical no-no, plans for such a device are rarely seriously discussed. In fleshing out the idea Bujold interviewed a number of doctors about the idea. Two responses that struck her as interesting were from a married male doctor who thought it was a marvelous idea and a single male doctor who was firmly against it. Though there seems to be a clear separation between the two, it’s pretty amazing how many scientists readily admit that they were influenced by a science fiction story, thought “this could be a reality,” and attempted to make it so. If the reader can think of any inspiring examples I would love to hear about them in the comment section below. It looked like a straight forward murder case - a prostitute, perhaps killed by her john. It was anything but; and it would have huge ramifications in two cities unlike any other.